Gosh what a busy week it’s been here at Bobtails. Bunnies coming and going like trains in a station. Though I must say Buster and Babs, my cute Netherland Dwarf friends, have been waiting slightly longer than most for their new home. They have been two of Bobtails’ longest staying bunnies, clocking up 4 years out there in the Bobtails garden, and have now gone to live with Gillian, who runs Heathland Animal Sanctuary in Hertfordshire. We’re all very sad to see them go but are absolutely delighted they have found a new mum after all this time. As two buns go, another goodness knows how many are waiting to fill the empty pen, and word in the warren is that we’ve had a big boy join the ranks this week. I’m not quaking in my fur coat, as some of the other bunnies suggest I should be, after all how big can a French Lop be?? But I was a little bit concerned when I heard Delia talking on the phone the other day ...”He’s called Jimmy, he’s 5 years old and he’s bigger than Mr Scruff”. He can’t be bigger than me, can he? I’ll keep you posted. Talking of big bunnies, here’s some news about a bunny with a big personality. 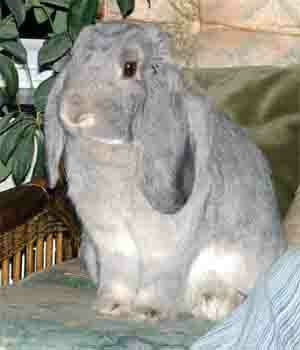 Freddie is a Dwarf Lop who lives with Karen and Graham Pankhurst and this week he celebrated his 12th birthday. How fantastic is that !! What’s even better is that he even got to wear a birthday hat. Respect, as they say in the warren, respect. As you’ll know, if you keep an eye on our website, Tamsin has been busy updating some of the pages, bringing my fans even more information about Bobtails and bunnies. A big nudgey cuddle goes out to her from all of us here. And talking of nudgey cuddles, I’d also like to give those lovely lady volunteers who come to help out a nudgey cuddle – each, one at a time girls!! Anytime ladies, you know where I am. Anyway, back to the matter in hand. Two of the lurvly ladies, Claire and Lisa, helped Jim and Delia out at their Bobtails stand at the Katz Castle Open Day. Stevie, a young lassie who is helping out at the rescue as part of her Duke of Edinburgh Award Scheme, was also there. Between them they spread the rabbit word and raised a few vital funds to keep us all in carrots. They had a ‘Guess the Name of the Bunny’ contest – and I’m proud to say I was able to be of assistance to them by allowing them to use my name. If I had been called Thumper or Fluffy then I could have understand when Delia told me someone had guessed the name correctly – I thought Mr Scruff was quite unique but obviously not. Someone I have made a bit of headway with this week is the Bobtails resident dog Tess. She’s about 5 times bigger than I am so you’d think she’d be able to take a bit of fun in the garden but no – whenever I binky and spin round and round her she gets all frightened. Delia says what do I expect when I “bound around like an idiot”. Anyway, I tried to be a bit more gentlemanly, creeping up to her step by step and it’s worked – she even lays down next to me now. I’d say that’s about enough from me but I’ll be back again with some more news next week so don’t forget to pay us another visit. And don’t forget, all us bunnies love a nudgey cuddle.